You know when you find one of those books where the writing itself is as beautiful as the story? Glass Girl is like that to me. Big emotions, great characters, and a totally swoon-worthy romance. I’m no cowgirl, but I totally loved this Wyoming story. This one took me by surprise. After reading the back cover copy, I wasn’t totally sure what I’d be getting into. Something about best friends and a cross-country trip? Reuniting with an estranged parent? It sounded a little Hallmark-y to me, in all honesty. Bischof won me over with her straightforward writing. She kept it real when it came to Riley’s relationship with his dad. I liked the way she set up the relationships – the history between Riley and his parents, and his developing relationship with the girl. Every time I read historical fiction, I think I should read more of it because I enjoy it so much, especially when it’s as done as well as Christy Award-winning author Cathy Gohlke’s novels. This novel goes deep and paints the Civil War in stark detail. For history fans interested in a clean read, this is a must. I love when authors tackle difficult subjects with poise and honesty, and that’s just what Carla Stewart does in her debut novel Chasing Lilacs. Twelve year-old Sammie faces her mother’s mental health issues and suicide during a time (the 1950s) when these things were hushed up. It’s a bit darker than some of my other selections here, but still a worthy read. Okay, don’t read the Goodreads copy because it’s really confusing. This book is a continuation of Tyers’ Firebird series, so it’s probably best to start there. I read this one first, and I promise it’s not as confusing as Goodreads makes it sound. Wind Haworth was my favorite character. She’s a young diplomat trying to find her place in a very tense politically volatile situation. I really liked the marriage of politics and sci-fi in this novel. This is a light, fun sci-fi story that I think would appeal to fans of Firefly. A quirky crew and a space mission. What’s not to like? Definitely worth checking this one out. Update – sorry. It looks like this one is currently out of print! I remember being really impressed with the fact that the characters don’t whine when they’re faced with really tough choices. (I mean, let’s face it. Whining can ruin a great story. Even Luke Skywalker’s whining got old, right?) I found the whole can-do attitude and the story itself really intriguing and refreshing. I love fairy tales retold, so as soon as I saw this retelling of Cinderella, I was intrigued. This isn’t a classic Cinderella. Davidson’s heroine finds herself recruited to spy for an unknown Lord who promises, in exchange, the one thing she wants most: freedom from her step-mother’s domain. What will she do when completing her task requires her to betray the prince with whom she’s falling in love? I read this book months ago and I still wake up thinking about it sometimes. I loved the story-within-a-story element to this novel. What is it about a boy with wings that I find so intriguing, too? Gah. I loved it. If you’re a fan of dystopian stories or steampunk, you definitely have to check this one out. If you’ve read and enjoyed any of these books, help the author out. Take a few minutes and rate them on Goodreads and post a quick review! You don’t have to do anything fancy. Think of two things you liked and a book or genre that you found similarly enjoyable whose readers might also enjoy the book. Post, and you’re done! Doing this really helps an author out. Amazon and other sites have goofy rules about what promotional tools authors can access based on the number of reviews posted for their work. 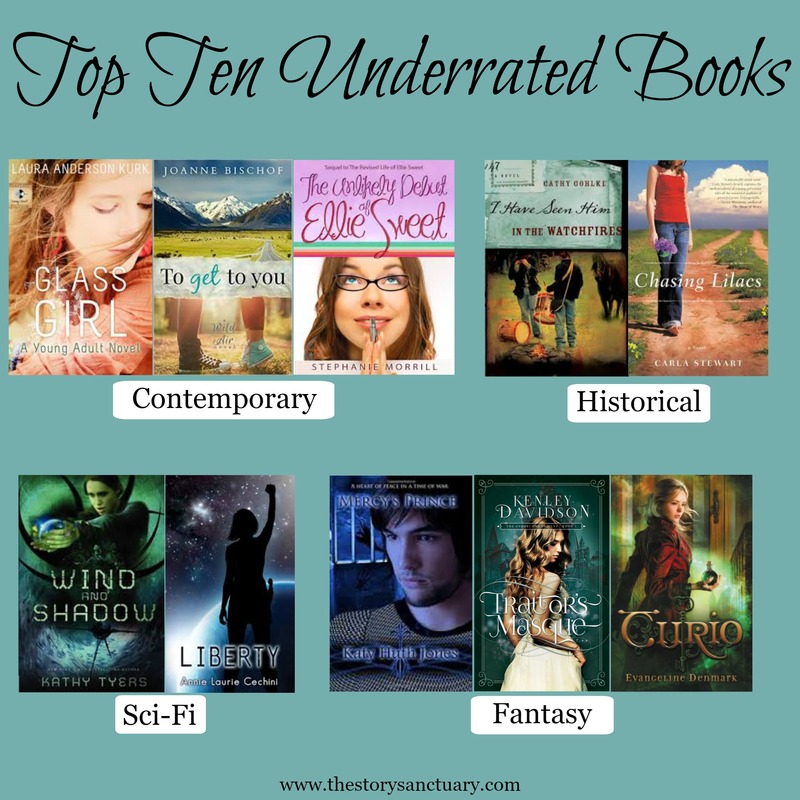 Tagged Clean Young Adult Books, Top Ten Tuesday, Underrated Books. Bookmark the permalink. Great list, and I love the way you organized it (i.e. the images). I haven’t read any of these, I will have to check out the SF/F ones. I hadn’t heard of these books before but I’m intrigued by Traitor’s Mask. There’s a lot of retellings out there so it’s cool to see how different author tackle the same original story. I hope you check it out! I liked the original elements she brought to the Cinderella story. I’ve got her other novels, too, and I can’t wait to read them. Thanks for visiting, Liselle! That’s a really cool idea! I’ll have to put one together. I still need to read To Get to You – it is on my MUST READ list. And I loved Curio – I definitely think it needs more exposure! Thanks, Carrie! I hope you enjoy To Get to You. It was a Christy finalist this year. 🙂 I can’t wait for the sequel of Curio. I hope it’s as good!